Let’s talk weddings, as well as the sharing of photos on social media. Some of the pictures are beautiful, yet many make me cringe. Bad hair, bad makeup, ugly bridesmaid dresses…and then venues that are generic and only face-lifted by flowers and lighting. The dance floor pictures are by far the worst. It’s like prom (and I hate saying this, but): As elegant as you hoped to make your special day and for all of the time and money you spent in making it magical, the whole affair looks like it was trite and cheesy. I guess I’m particular because I worked for Elegant Bride magazine in college, but I feel so sorry that Americans pay tons and tons of money for everything from the engagement up until the wedding ceremony, only to capture all of these “perfect” moments in photos that they will keep until the end of time… Because the photos look disingenuous. You’re better than that; your relationship deserves better than that. How does one do it right, make their wedding authentic to their relationship? Personal, simple, elegant? Destination to keep it low-key and natural, while knowing that only the people you actually want to be there will arrive? Or grandoise and over-the-top because it’s the biggest day of your life and will (should) only happen once. If your party list is big (and even if it’s not, because a bride has so much to do), you probably won’t even get to speak to everyone you’ve invited (though yes, there will be more gifts). I feel like if I was ever to get married, I would want it to be very much about love and not so focused on all of the formalities, including trying to impress people I don’t even care about. Perhaps I will wed at City Hall and then throw a big party. But the thought of making my friends wear those ugly dresses and a commercial DJ who can never get it right because s/he has to please people of all ages, and older people are typically giving bigger gifts… oh it’s all so dreadful. The only pretty part is the church (or other house of worship) ceremony and the outdoor pictures thereafter. Everything else is just dreadful, dreadful, dreadful. Disclaimer: I have been to some fabulous weddings, but this is based on the many wedding pics that come up on my FB news feed, not those that I’ve attended. So close friends, do not worry—unless you think your wedding looked like a prom. Wedding Make-up and Photography in the Jersey City/NYC area. 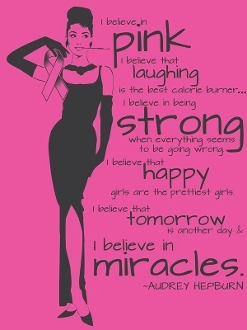 I believe that tomorrow is another day; I believe in miracles.